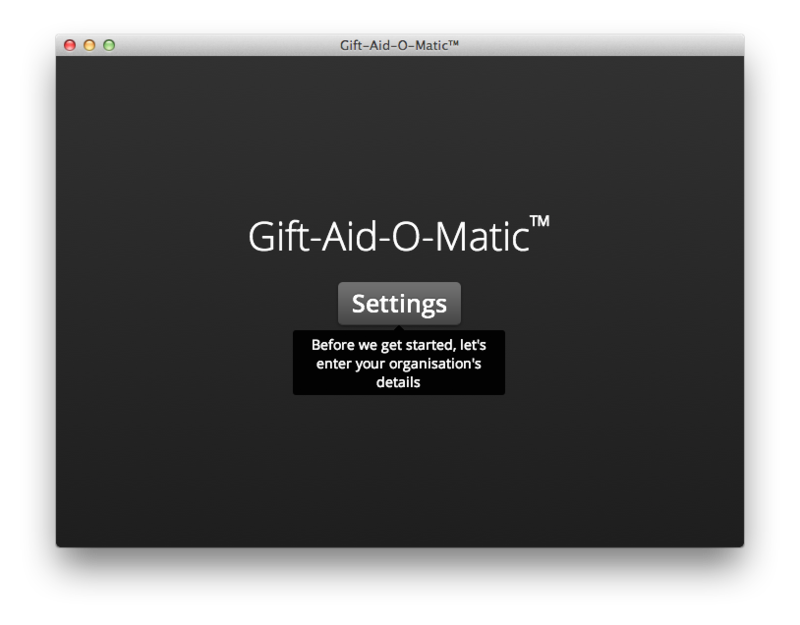 Sorry, Gift-Aid-O-Matic is no longer available for download. In the settings screen, enter the appropriate details in every box. 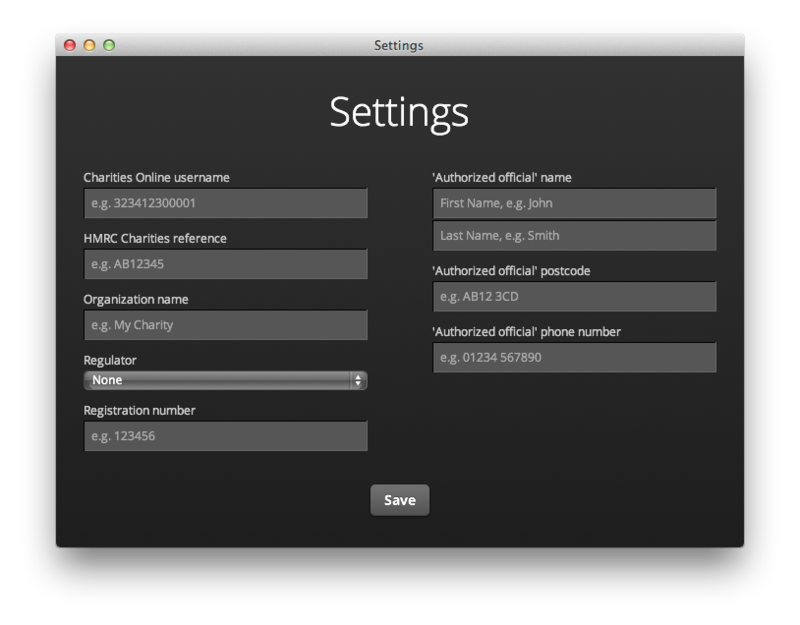 If you don't have a registered charity number, choose 'None' from the Regulator dropdown, and leave the Registration number box blank. Every other box must be completed for the submission to work. If you are unsure about any of these details, contact HMRC. Click Save when you're done. Your settings will be saved on your computer, so you won't need to enter them again. "Bob","Smith","The Heath, Marylands Road",BA23 9CD,2.50,"3/10/2012"
Gift-Aid-O-Matic has been tested with a file containing 100,000 donations. The maximum number of donations HMRC permits in a single claim is 500,000. One claim can be made per day, so we suggest you split very large claims over multiple days to improve performance. 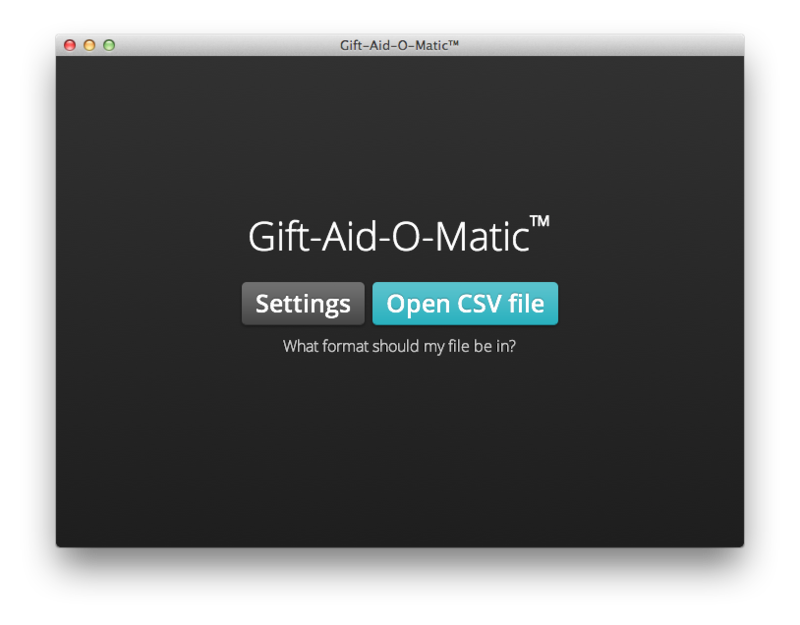 Once your CSV file has been loaded, Gift-Aid-O-Matic will show you a preview of the data as it will be submitted. You should pay particular attention to the date field to make sure the formatting is correct: dates will be submitted to HMRC in the format YYYY-MM-DD. We strongly recommend you save a copy of the submission before sending it. 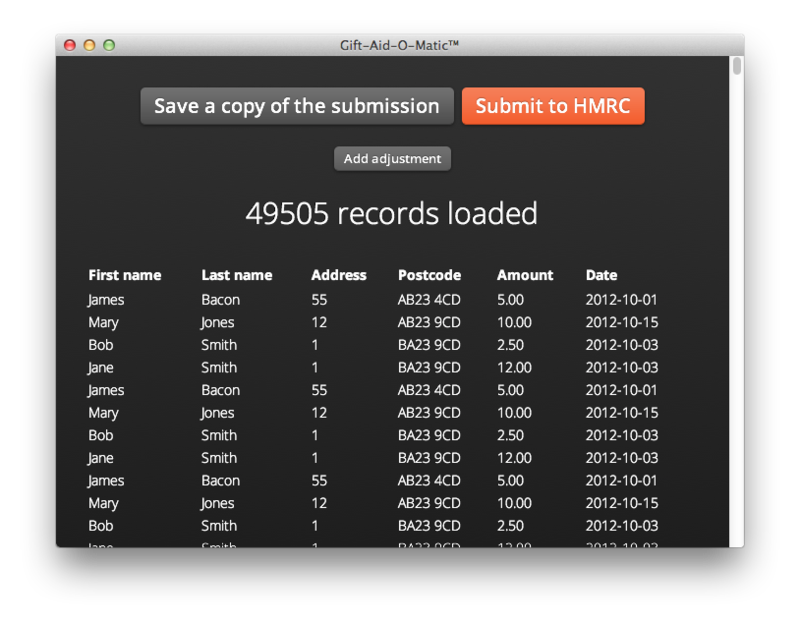 It will be saved in XML format, exactly as it will be sent to HMRC, except your password will not be included. If you have overclaimed in a previous submission, you can provide an adjustment to reduce the current claim by the corresponding amount. Click 'Add adjustment', and enter the amount to reduce the current claim by in the left-hand box. You should provide an explanation for HMRC in the right-hand box. When you're ready, ensure you have an Internet connection and click 'Submit to HMRC'. 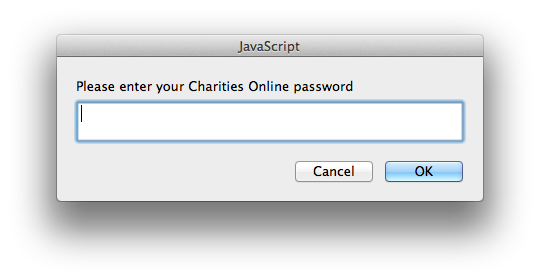 Gift-Aid-O-Matic will ask for your Charities Online password: be aware that this is shown on the screen so you can check it before sending. Depending on the size of your claim, submitting it may take from 10 seconds to several minutes. When complete, you should save a copy of the receipt for reference. 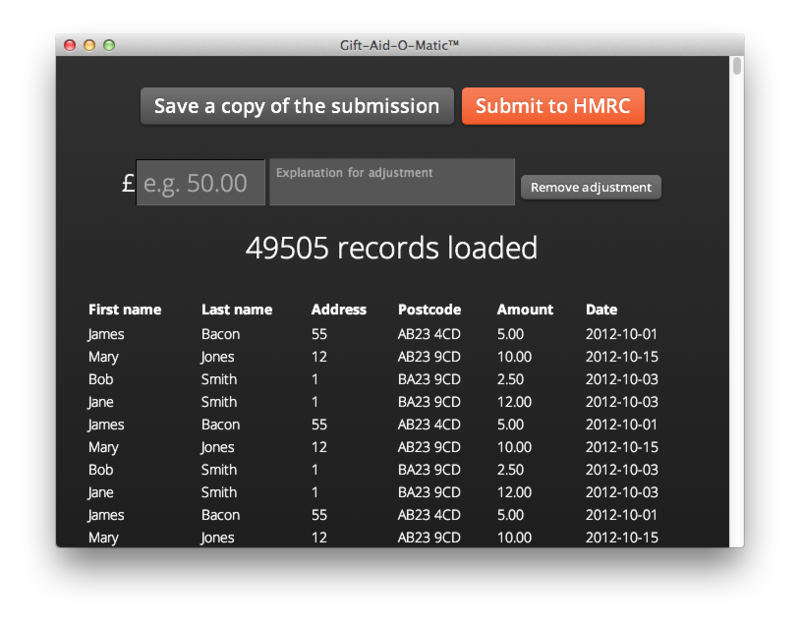 It will be saved in XML format exactly as received from HMRC. 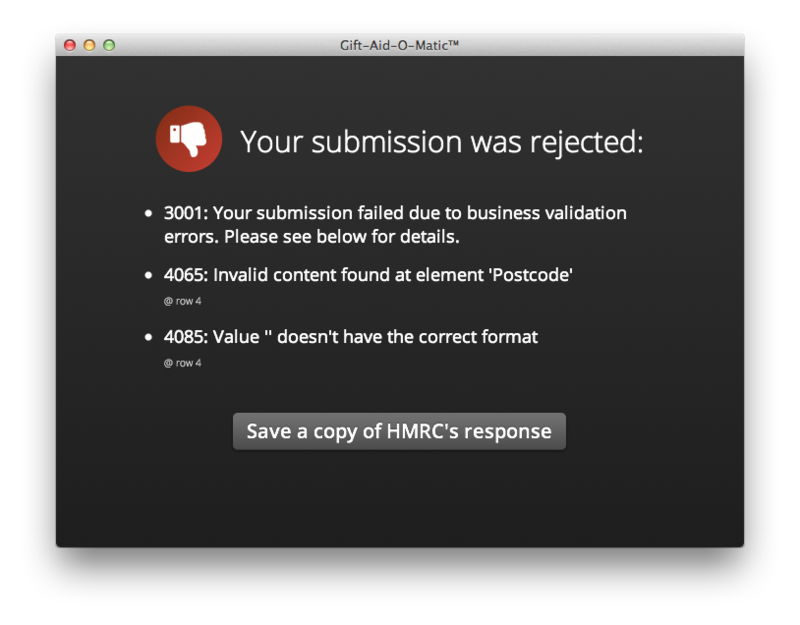 If Gift-Aid-O-Matic hits any problems submitting your claim, it will give you the exact text and error numbers provided by HMRC. You should quote these when speaking to the charities helpline. If there is a problem with your file, it will show the row numbers which produced each error so you can check your CSV file. 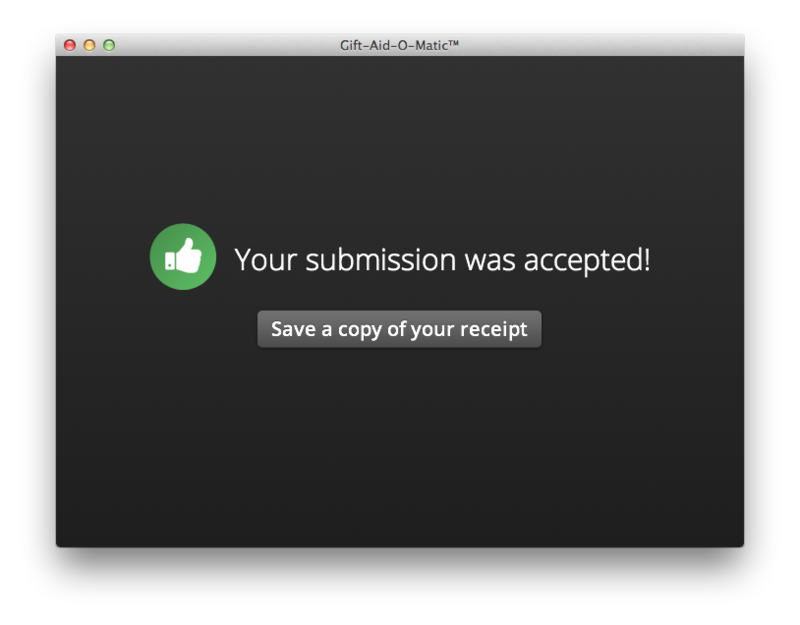 To re-send the submission, click File > Open CSV File... and start from the beginning.